The offical due date has now been decided. July 30th at 7:30 AM. I've been taking my mind off the fact that they are once again going to slice me open and for a while my guts will be outside of my body (OK maybe it's not so off my mind- if you can think of anything better for me to obsess over right now I'm VERY open to suggestions) by reading a really cool book Michael Pollan's The Omnivore's Dilemma. It's about the food chain and it gives you tons of things to think about. What really hit me is the sustainable ag farmer he followed said that it's not about starting a movement, but giving people who want a choice that choice. You need to read this book! And if you do and want to see a local couple's attempt at keeping things local visit Tim's cousin's web site- Sugar Creek Farm. And on a related note, what goes in must come out. This afternoon we went toilet shopping. We had actually been before and picked out which toilet we wanted for the downstairs bathroom. Unfortunately that toilet was $600+ dollars and now that we are a one income family that wasn't going to fly. So back we went. I really wanted a Kohler. That's what we have in our master bathroom and I'm really happy with it. I don't remember what brand we have in the guest bathroom upstairs, but it's a dud. So I think this is what we are going to settle with. Although it's always hard to say until the thing is purchased and sometimes you still can't say even when it's in place. 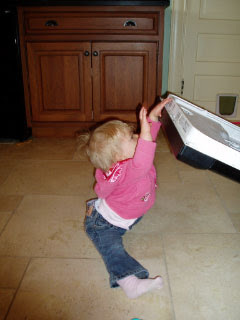 And to make mom happy (and maintain the plumbing theme) here's Molly a couple of months back helping load the dishwasher. She's so helpful it's annoying. I'm such a heel, I haven't yet read The OD. But thanks for the shout out. We'll be looking for you at the fair. Madeline sings at 6:30 Friday night and then we'll probably head on over to the derby. I've read Omnivore's Dilemma, it's a real eye-opener. I read something similar in the NY Times a few years ago. It made me think differently about food and change a lot of my food habits. Six hundred bucks for a toilet! Cripes. That makes my frugal head spin.